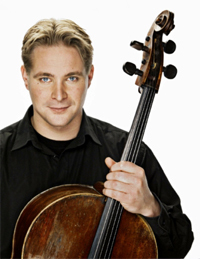 Cellist Jan-Erik Gustafsson began his studies with Markku Luolajan-Mikkola at the West Helsinki Music Institute. He studied further with Mikhail Homitser and Frans Helmerson at the Edberg-Musikinstitut in Stockholm, completing his soloist diploma examination in 1992. At the age of fifteen, Gustafsson placed well in the EBU Young Musician competition in Copenhagen, and since then he has performed world wide both as a soloist and as a chamber musician. He has appeared with numerous distinguished orchestras such as the London SO, the Bournemouth SO, the Berlin RSO, the Netherlands RSO, the Danish RSO, the Swedish RSO and the Stockholm Philharmonic, the Hong Kong Philharmonic, the Jerusalem SO, the Washington National SO, the New York and Vienna Chamber Orchestras, Camerata Bern and the Amadeus Chamber Orchestra. He has appeared with nearly all Finnish orchestras. In 1994, Jan-Erik Gustafsson signed a contract with the American YCA agency. Consequently, he regularly gives solo recitals on tour in the USA, Europe and the Far East at venues such as Carnegie Hall and Alice Tully Hall in New York, the Kennedy Center in Washington, Suntory Hall in Tokyo and the Brahms Hall in Vienna. At chamber music festivals worldwide, he has collaborated with Pinchas Zukerman, Ralf Gothóni, Leif-Ove Andsnes, Paavali Jumppanen and Arto Satukangas. Jan-Erik Gustafsson has made several recordings for Ondine. His disc featuring Cello Sonatas by Szymanowski, Kodály and Schnittke (ODE 827-2) was nominated Record of the Year in 1994 and his Englund Cello Concerto disc (ODE 951-2) was nominated Record of the Year 2000, both by the Finnish IFPI. Jan-Erik Gustafsson plays a Carlo Giuseppe Testore cello from 1718 owned by the Finnish Cultural Foundation.